Tickets are booked with PanAtlas offline. That seems to go against the current trend. However, there are a few good reasons why choosing to do it this way. We would like to tell you more about the advantages of booking through PanAtlas. Airlines present airfares and availability in computer systems in such a way, that they can strongly influence the buyer of an airline ticket. Because of many years of experience, PanAtlas knows how airlines use these marketing strategies. By using this information in a clever way, PanAtlas frequently manages to obtain substantial discounts. This enables us to offer very attractive fares. PanAtlas knows which airline flies to each destination worldwide. When you search for an airline ticket yourself, you will likely miss one or more options, as no computer system has a 100% coverage. This means that in many cases you could have flown cheaper. In case you already managed to find the lowest fare on a route, then we can provide the assurance of a professional that the fare you want to book, is indeed the lowest fare in the market. Many individuals and organisations are tired for searching the internet for the best fare. Instead of endlessly searching yourself for the cheapest rates, PanAtlas gladly does this for you. This is more convenient and in the end also far more efficient than you or an employee spending many waisted hours searching. Many people still value personal contact and advice. By listening carefully to your question, we can often provide travel tips and information you wouldn't have considered before. 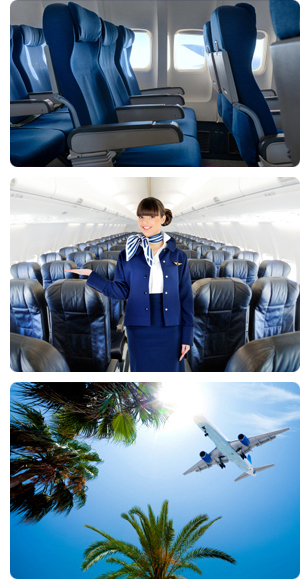 PanAtlas can put tickets of most airlines on option, without any charge or obligation. This way you have the certainty of a seat on board your desired flight, whilst finalising your other travel plans. PanAtlas has in-depth knowledge of the product and services provided by all airlines. We can inform you well about the flights you book. We can provide information about seat pitch, safety, catering, punctuality, bagage handling, frequent flyer programs and the entertainment on board or the ease of a certain transfer airport. If you encounter any problems or emergencies during your travels, one simple phone call, sms or e-mail is usually sufficient to change your ticket - 24 hours per day, 7 days a week.